Routers are networking devices that forward data packets between networks using headers and forwarding tables to determine the best path to forward the packets. Routers work at the network layer of the TCP/IP model or layer 3 of the OSI model. Routers also provide interconnectivity between like and unlike media (RFC 1812). This is accomplished by examining the Header of a data packet, and making a decision on the next hop to which it should be sent (RFC 1812). They use preconfigured static routes, status of their hardware interfaces, and routing protocols to select the best route between any two subnets. 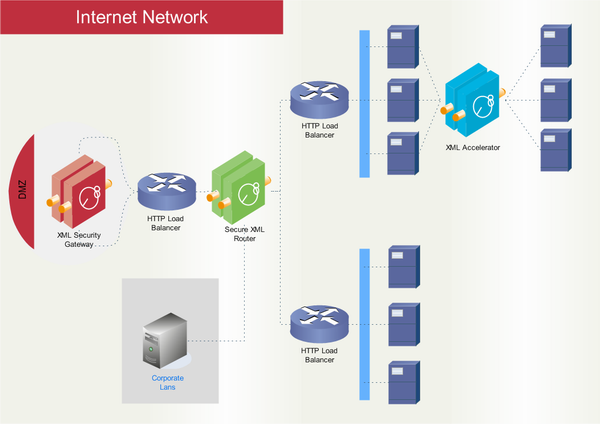 A router is connected to at least two networks, usually two LANs or WANs or a LAN and its ISP's network. Some DSL and cable modems, for home (and even office) use, have been integrated with routers to allow multiple home/office computers to access the Internet through the same connection. Many of these new devices also consist of wireless access points (waps) or wireless routers to allow for IEEE 802.11g/b wireless enabled devices to connect to the network without the need for cabled connections. Cisco uses its own brand of router symbols. Since Cisco has a large Internet presence and designs a broad variety of network devices, its list of symbols is exhaustive. 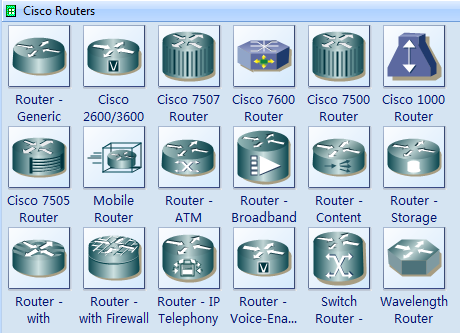 For CISCO specific network drawing diagrams, Edraw is supplied with CISCO specific router symbols.